SearchUnit is a search engine component library for MVC & Web Form applications. No restrictions on; number of searches, index size, document limit or file types you can index. A truly fully featured, full text search experience for your site. Our latest AJAX based end user interface is smooth and quick, exactly what users will expect. Build the best internal search for your app. by using our open API and Plug-in architecture to make your internal search engine work your way. Classifying, sorting and filtering of search results helps users drill down into your application’s data. Faceted search is implemented by specifying filterable and sortable dimensions (such as product brand, price, document dates, authorship, subject taxonomy etc). SearchUnit enables faceted search through its CustomData fields and related dynamic filters and sorting controls. Indexed documents and pages can have additional meta data fields assigned to them, either through meta tagging or SearchUnit’s plug-in interface. This structured data can then be used with facet filters to provide user driven focus to results. The search results page can be adorned with multiple types of prebuilt filter and sorting controls – such as integer ranges, date ranges, string matches, string exclusions, drop down lists etc (please see the SearchUnit help for more detail). Our jаvascript based usage and web services (WCF or ASMX) architecture mean that client platforms and frameworks such as MVC, Web Forms, ASP.NET AJAX, HTML, ASP, jQuery, AngularJS, Azure etc are all supported. Server-side web services mean mobile platforms such as Android, iOS can search too. Windows Services, or the Task Scheduler can be used to periodically reindex content, and use our API to incrementally index content immediately. What are your search engine choices? If you are evaluating search engines for your project you will probably be considering our SearchUnit product against others such as Solr, ElasticSearch and Lucene. Below is an attempt to provide a frank look at the fundamental differences and likenesses of these search engines (and yes we have included weaknesses of our own product). Perhaps the most fundamental difference to consider first is whether the engine is a library or a server. Your project may already be constrained to a library by its requirements, and it’s important to realize this as early as possible. .NET Library – contained in a DLL, it runs as a part of your application. It is hosted by the .NET process that it is running in. Its DLL is bundled with your application. Server – self-contained piece of software, it runs on the host operating system. Typically requires its own installer, and additional resources to run its own Java application server. Of the 4 above, Lucene does not have built in indexers for rich content such as pdf, MS Office etc. SearchUnit, Lucene, ElasticSearch and Solr all support field based searching to various degrees but the latter 3 do have deeper support for field only searching. ElasticSearch, Solr and their commercial product derivatives are Enterprise grade search engine servers. They are capable of scaling beyond what SearchUnit currently can (it’s not easy to simply quantify that, but it’s in the ballpark of many millions of documents). SearchUnit can be hosted in server farm environments, however its indexes cannot be divided into sections (shards) that are hosted on separate machines. That means that if your project is scaling to the point where a single machine is unable to hold an entire copy of the search index (many millions of documents), SearchUnit will be unable to handle it. 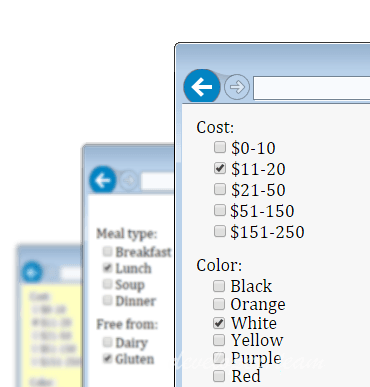 SearchUnit has a simple intuitive GUI that the others do not. After running the installer you can have a searchable index running within 5 minutes, and have added search to your own pages in 10-20 more minutes. Lucene is really an information retrieval system, and although it is suggested as a search engine solution it really does lack important features that a search engine requires. This is one reason that Solr and ElasticSearch (which are based on Lucene) exist. Solr and ElasticSearch themselves have commercial wrappers, because they are not as straightforward to use as they could be. Implementing these open source engines fully will conservatively require 2 to 3 weeks, and necessitate ongoing maintenance, which puts their true cost in the high thousands.